What a whirlwind of a trip for our educational team this spring! A lot was accomplished, lessons were learned, soccer was played and so much more. We have begun a different style of training for our Haitian teaching staff. Now we split up our teachers into content groups for subject specific training. We began this type of training in October and we’ve already seen improvements from this new system. Our early learning group is continuing to improve hands on learning with daily educational centers to build math, literacy, fine motor and creative skills. The social science team has begun working on interactive lessons using imaginative discussions, skits and group work. It was amazing to see students acting out the Haitian Revolution! The math and science departments are working to create lessons that include real world applications. We hope this will inspire our students to expand their minds and problem solve using their education in the real world. Finally, our language arts programs will hopefully begin writing book reports each quarter. As always, we are coming together as a school to improve learning with lessons that encourage students to create, evaluate and analyze their material in addition to addressing all learning styles to ensure every single student has a chance to succeed. Maddie, a high school senior from Middle Creek High School, held a soccer clinic for girls 3rd grade-philo! Yes that’s right, our girls had a chance to sharpen their skills out on the field. She lead drills to improve dribbling, passing and shooting. Each day of course ended up with a scrimmage. The girls were a little shy at first but by the end of the week, we had intense match ups and a whole bunch of fun! We were happy to welcome Jerry Decker, our educational board director back to Haiti for the first time in 10 years! He had the privilege of seeing how much progress was made in such a short time. 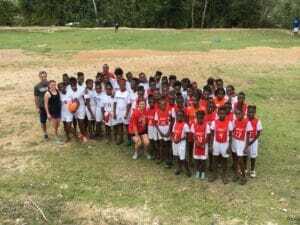 “While serving on the board of directors for the Hope for Haiti Foundation, it had been almost 10 years since traveling there prior to the earthquake of 2010. In short, I was simply amazed at the amount of positive changes I witnessed during that week.” -Jerry. It was amazing to have the teaching expertise from Jerry and his daughter Kaityln, who were both very helpful in our math and social science workshops. 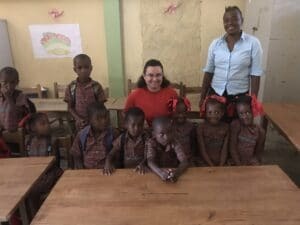 For Julie Schultz, our current educational director, this is her final trip before she moves permanently to Zorange to join our Haitian teaching staff full time in August. For Julie, that will be trip number 20 and include 10 years of service to the Hope for Haiti Foundation. We are incredibly thankful for her dedication. Julie lead a beautiful celebration for our teaching staff to thank them for their hard work and commitment to providing excellent education. We celebrated their many accomplishments including 100% passing rates on national exams last year. Julie sums the party and the trip here, “We led workshops and a girls’ football (soccer) clinic and hosted a party to celebrate the many accomplishments of our Haitian teaching staff. I was honored to play a role in this adventure!” Julie has returned back to the states one last time to prepare an english curriculum for our 3rd-6th grade classes. She will co-teach with a member of our Haitian staff in the fall as we pilot english classes for our primary students. We are so thankful for God’s help to make this trip such a success. As Kaitlyn perfectly said, “Even though from a material, monetary point of view, many of them have so little, they are so rich in happiness. This happiness is contagious and I found myself wanting to catch this abundance of happiness that they possess.” We look forward to continuing educational training in the fall and collaborating on projects to spread this happiness and hope throughout Haiti.